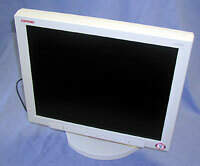 The Compaq TFT8020 LCD monitor boldly goes where no display has gone before'right up to the edge of the case. The wide bezel around most monitors serves no useful purpose aside from holding sticky notes or securing the display in a rugged environment. The narrow bezel of the Compaq TFT8020 monitor adds more viewing area without increasing the size of the case in a standard form factor. Notebook PC makers have been slowly advancing into this border zone, edging their screens closer to the edge of the case. PC monitors have changed less because their makers have not been forced to respond to notebook buyers' dual demands for a larger viewing area in a lighter package. The Compaq TFT8020 steps into the border zone with an 18.2-inch diagonal viewing area. At first glance it looks more like a 15-inch panel. But when you look closely, Compaq has squeezed the border to put more viewable screen into the same form factor. There is still a bit of a border but not enough for sticky notes to cling to. The monitor itself performs well with standard 200-nit brightness, a measure of screen luminescence. Most CRTs have about 160 nits, most LCDs have 200. The 160-degree conical viewing angle makes the panel as legible off-center on the horizontal axis as it does off-center along the vertical. Top resolution is 1,280 by 1,024 pixels, although the TFT8020 looks slightly better set at 1,024 by 768, where it supports a refresh rate of 85 hertz. At the higher setting the refresh rate is 75 hertz. The TFT8020 weighs a hefty 21 pounds, 7.4 of them in the base. Its antiglare coating makes black look truly black instead of washed-out gray as on many other LCDs. If you're hunting for a space-saving desktop PC display that puts a lot of screen in a small volume, the TFT8020 is a good choice. There's one border, however, that you might be unable to cross'the high price.